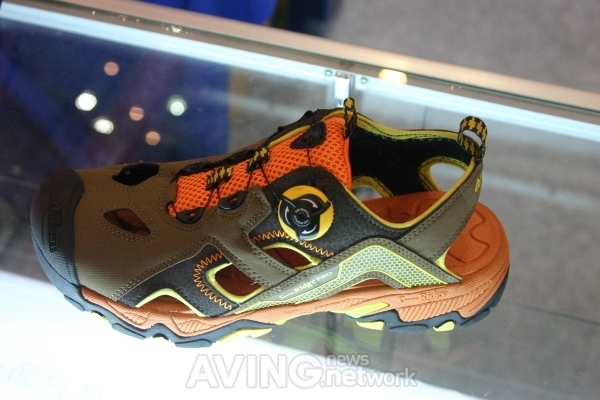 Windwire(www.windwire.co.kr) introduced "ROLLKIN" the shoelaces fastener at Busan International Shoe Show(BISS) 2014 at BEXCO Exhibition Center on September 25th to 27th. Windwire CO., LTD. has produced shoes, earphones, and other components and materials, and they innovated in producing shoelaces faster and its related parts to ensue other added values. "ROLLKIN" is the lacing system that helps infants and seniors having troubles to fasten or unfasten their shoes. Without tying laces, the user just needs to rotate jog dial. When the user unfastens, the user simply pulls back the jog dial. A related staff explained, "There are a few producers making such a jog-dial-type-shoe-lace fastener, but there is no one producing a jog dial that perfectly suits the shoe design," and continued, "We are supplying our products to NEPA, The REDFACE, WILD ROSE, and TUSCARORA plus other hot brands."